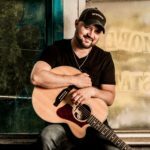 When Warner Music Canada recording artist Aaron Goodvin was announced as the winner of the 2018 CCMA award as Songwriter of the Year, it was a sign that the music industry was acknowledging what the public already knew – a new star had arrived! Aaron recorded and released his 2016 self-titled debut album with the confidence of having already enjoyed success as a songwriter contributing the track “Out Like That” on Luke Bryan’s multi-platinum album Crash My Party. And, when Aaron started writing the songs for his forthcoming sophomore release, he had the confidence of three Top 10 singles on his debut including the platinum-certified smash hit “Lonely Drum”. With those hits under his belt and an incomparable live show, Aaron Goodvin has become one of the most talked about new names on the Canadian country music scene. With the wind at his back, Aaron spent the spring of 2018 in Nashville working on material for his new album. Fans will not be disappointed as Aaron once again delivers memorable melodies and his unique voice to this new set of songs. The album’s lead single, “You Are,” is just a taste of things to come. With its infectious hook and groove, the song, co-written with Brandon Hood, the song captures the joy of a man in love. Writing memorable hooks is what Aaron has been all about ever since he relocated from his hometown in Spirit River, Alberta to country music’s Mecca, Nashville. After signing with publishing powerhouse Warner Chappell Music, Aaron scored his first major league contribution with the aforementioned Luke Bryan track and followed that up with contributions to Jon Pardi and Cole Swindell. Those kinds of calling cards get you invited into a lot of writing sessions, but Aaron had additional ideas about his place in the music world. Aaron is as comfortable on the stage as in the writing room and has toured with Johnny Reid and Gord Bamford as well as appearing at major festivals and headlining his own shows across Canada. Aaron’s versatility and passion for writing and performing are second to none. Aaron has a natural ability to light up a stage, connect with his audience, and deliver a show-stopping performance, whether it’s a small intimate gathering or a crowd of thousands.